It's back. SM Megamall's Mall-wide Food Festival starting today (February 24, 2012) until Sunday (February 26, 2012). Here's a perfect Friday for you: Today is the first day of the Mega Food Sale! Over 100 choices of nonstop dining promos and discounts! Treat yourself to a lavish lunch for less! 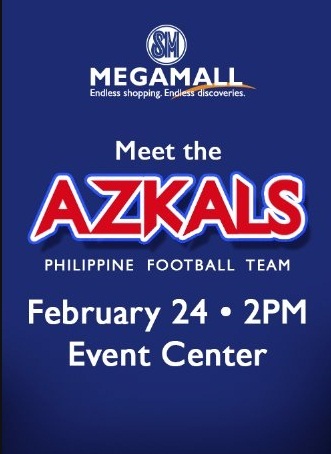 And then drop by the event center at 2pm to meet Phil, James and the rest of the Azkals team! Oh yes! Happy Mega Friday! Entrance is free but autograph signing with the team is only available for the first 100 fans! Registration opens on Friday, 10am at SM Megamall's Global Pinoy Center located at the 5th level of building B. 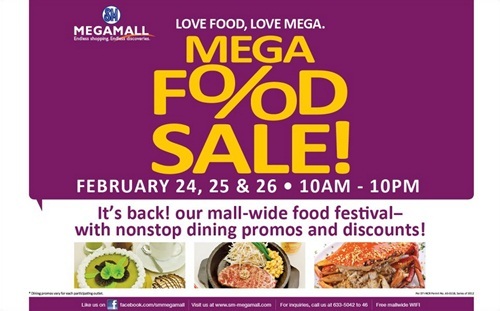 Eat your heart out at the SM Megamall Mega Food Sale on Feb 24 to 26! Huge discounts and price offs! Buy 1 take 1! Eat all you can! Free appetizers! Free desserts! Free drinks! And many more! Cajun Red Rock - Buy the creole chicken pasta worth P250 or original classic burger worth P245 or a red rock salad worth P270 or bottomless iced tea P99 for only P1 for a minimum purchase of P500! And so much more food promotions and discounts.